The hallmarks of success. It featured novel characteristics, like the oversquare bore and stroke (60x44mm) and a unit construction engine built on compact lines. to retain identical wrap-around styling, right down to the front mudguard, so that the new 350 shared the poor image of its predecessor. 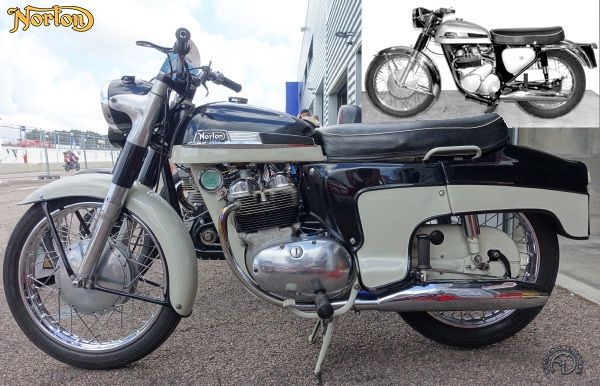 Undeterred, Norton went back to work and unveiled the Electra at the start of 1963.
electric start. The Electra might have been a success. but it was too late. In the hard- fought 400cc category, the Electra proved too fragile to be a real challenge to the more attractive and sophisticated Japanese bikes. Modern in concept and classic in appearance, the Electra came on tbe scene too late, and went outof production during 1965.